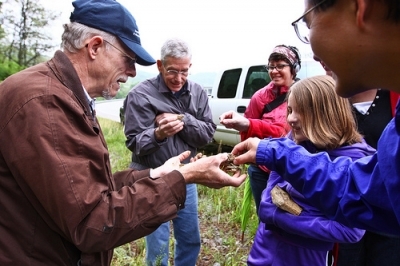 The College of Arts & Sciences is very pleased to announce that Dr. Frank Ettensohn of the Department of Earth and Environmental Sciences has been named the 2013-14 Arts and Sciences Distinguished Professor. Dr. Ettensohn’s thirty plus year career at the University of Kentucky is remarkable for its breadth and depth across all the roles expected of a university professor. He has become an internationally recognized and widely published expert in sedimentary geology and paleontology, excelled in both undergraduate and graduate education, and compiled a truly distinguished record of service to the University, the Department, the science education community of central Kentucky, and the profession at the local, national, and international levels. Dr. Ettensohn is a leading scholar in the area of classic, field-related stratigraphy and paleontology (the study of sedimentary rock layers and the fossils contained in them). He has nearly 200 publications, including 83 refereed papers. Notably, more than half of his publications are coauthored with students, reflecting the strong mentoring role that Dr. Ettensohn takes in his students’ careers. 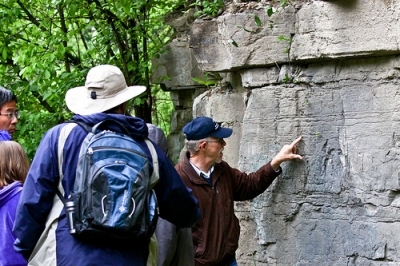 His primary research area is the geology of Kentucky and the Appalachian Basin; a series of guidebooks that he and his students have written have revitalized and modernized understanding of Kentucky geology. One of these guidebooks, "Changing Interpretations of Kentucky Geology--Layer-Cake, Facies, Flexure and Eustacy", is often referred to as the “Bible” of Kentucky geology. Dr. Ettensohn is an international leader in two further areas: (1) identifying ancient earthquakes and (2) black, oil, and gas shales. Ettensohn developed a technique of using deformed sediments to identify the location and probable intensity of ancient earthquakes. He has received many invitations world-wide to speak on this topic, and his work resulted in an edited volume, "Ancient Seismites", published by the Geological Society of America. His research has also spawned a series of models that has brought about a major paradigmatic shift in how geologists understand the formation of shales. His many research awards include two Levorsen Best Paper Awards from the American Association of Petroleum Geologists and the Superlative Award for a Distinguished University Scientist from the Kentucky Academy of Science. He is a Fellow of the Geological Society of America and received the 2013-14 Jefferson Science Fellowship from the U.S. State Department. Dr. Ettensohn has taught at least 24 different courses at the University of Kentucky, including in the Honors, Discovery, and Modern Studies programs. Student evaluations are consistently 3.5 or above. Throughout his career, he has maintained a strong interest in experimental undergraduate education and developed several innovative interdisciplinary undergraduate course series including Mankind’s Place in the Universe, Modern Studies, Global Studies, Freshman Discovery, and the Honors Program. Dr. Ettensohn was awarded two Fulbright Teaching/Research awards to the former Soviet Union and Nepal, was a visiting professor in Ecuador, and has taught in China for the past eight summers. He was awarded the Educator of the Year Award by the American Association of Petroleum Geologists for his emphasis on field-related education. Recently, Dr. Ettensohn worked with Study Abroad courses in the Honors Program and co-led student trips to Ecuador and India. He is a superlative undergraduate and graduate mentor. Former students unanimously agree that his high expectations made them better scientists and teachers. Dr. Ettensohn has successfully mentored 33 M.S. students and 10 Ph.D. students to completion. Many have gone on to productive careers in academics or industry. Dr. Ettensohn has a truly distinguished record of service. He directed the Honors Program from 2008 to 2012 and was departmental chair from 1997 to 2005. He has served on multiple College and University area advisory committees, is a member of the Math and Science Education Program Faculty in the College of Education, has served on at least three unit review committees, and chaired the review of the Kentucky Geological Survey in 1999. He has also worked on the International Advisor Council, UK AMSTEMM, the Appalachian Math-Science Partnership, Kentucky, NSF EPSCoR Research Enhancement, Kentucky NCUR, Lexington Area Science Education Reform, KET Professional Development, the Arboretum Advisory Board, the Institute for Mining and Minerals Research Board of Directors, and the Governor’s Scholars Advisory Committee. Dr. Ettensohn has been a member, advisor, or officer of the KY Academy of Science Geology Section, the KY Society of Professional Geologists, the KY Paleontological Society, and the KY Section of the American Institute of Professional Geologist (AIPG), of which he was president in 2011. That year, the AIPG awarded him a Service Award, and the American Institute of Professional Geologists, Kentucky Section awarded him its Presidential Award . Most recently, he was elected as the Geological Society of America representative to the North American Commission on Stratigraphic Nomenclature – a commission that oversees the naming of all rock units across North America.